Hanoi (VNA) – National Assembly Chairwoman Nguyen Thi Kim Ngan has called on the Party, people and army to strengthen solidarity to overcome challenges to fulfilling 2017’s socio-economic development missions. 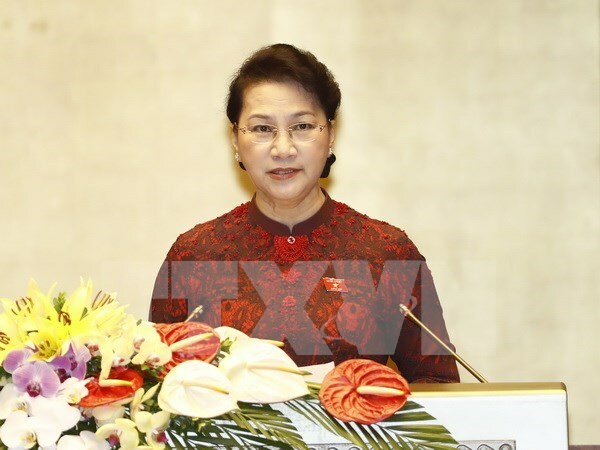 The top legislator made the appeal in her opening speech at the third plenary session of the 14th legislature that opened in Hanoi on May 22. She urged the nation and people to promote unity of thought and action to implement resolutions adopted at the 12th National Party Congress, particularly resolutions passed at the fifth meeting of the 12th Party Central Committee. Despite positive socio-economic development, Vietnam faces innumerable difficulties, she said. The economic growth is not sustainable, while some basic targets have been missed, she said, pointing to difficulties in industrial production and agriculture as well as damage caused by climate change. Legal violations in exploiting natural resources and mining have provoked public concern, as has environmental pollution in many places, she said. Infringements of food safety and hygiene laws, poor land use and management, along with corruption and wastefulness are still of public concern, she added. With solidarity, creativity and actions to benefit the people, the legislature will work hard to handle a lot of work at the third sitting, Ngan said. She asked legislators to make active contributions to the discussions at the session to meet the requirements and aspirations of people across the country. Deputy Prime Minister Truong Hoa Binh later presented a report on the supplementary evaluation of the implementation of socio-economic development plans and State budget in 2016 and early 2017. Law making will be a major focus during the 22.5-day sitting, with 13 bills and five draft resolutions expected to be considered and adopted, and five other draft laws to be discussed. Among the bills scheduled to be passed at this session are the law on adjusting, supplementing a number of articles of the 2015 Penal Code, the law on support for small and medium-sized enterprises, the law on management and use of State assets (revised) and the law on the State’s responsibility for compensation. The session will also examine a number of important socio-economic matters and evaluate the implementation of laws and policies on food safety in 2011-2016. A report from the Vietnam Fatherland Front Central Committee on petitions and opinions of voters and the public will be submitted to the session, and the NA Standing Committee will report on its supervision of the settlement of voters’ petitions that were sent to the legislature’s second plenary session. Three working days during the session will be devoted to the questioning of cabinet members.